Hate going to the Vet? Dislike going to the Vet? Tolerate going to the Vet? Love going to the vet? Bringing your dog to the vet can be a stressful experience for yourself, your dog AND your vet! 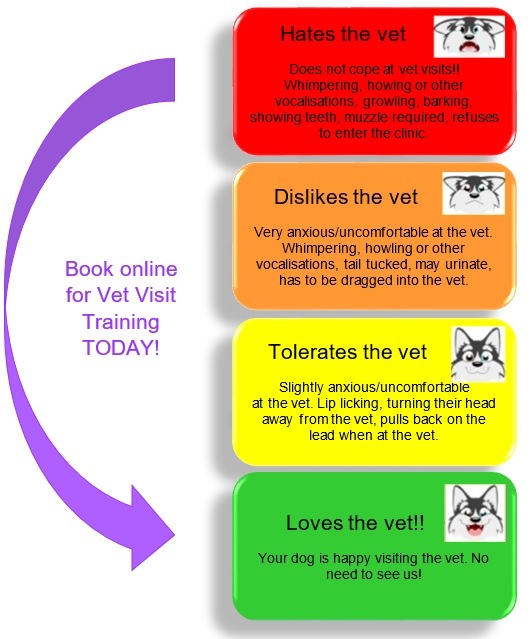 If your pet falls on the red, orange or yellow spot on this spectrum, then the Vet Visit Program is for you! What’s Involved in the Vet Visit Program? The Vet Visit Program has been created to assist pets and owners to have a worry-free Vet Visit. In these 3 x 30-minute training sessions, we commence the work at your vet clinic. Depending on what level your dog is at will depend where we start (either outside or inside of the building). These desensitization programs have assisted so many dogs to have a better experience at the vet. Please note that your consultation is based around the information you provide us with. There is no such thing as a quick fix. Your dog may require multiple sessions and/or specific products to assist in the modification plan. **Please note your booking has NOT been confirmed until you have been contacted directly by the office by SMS or phone call.